Elendaron is a place of magic, danger, and mystery. There are many different lands, underground, underwater, and floating in the air. The creatures residing there are just about as diverse as the land, and each one has made their area fit their lifestyle. It is ruled by a queen, Queen Malia. She is a new ruler, young, and elven. She must prove her worth with the wildness of the land, and against the strength of her enemies. Topography: The land of Elendaron is surrounded by water on almost all sides. In Elendaron there are massive amounts of forests, a few mountains, some desert plains, caves, and gentle rolling hills. Jungles are not unheard of, nor ice lands. 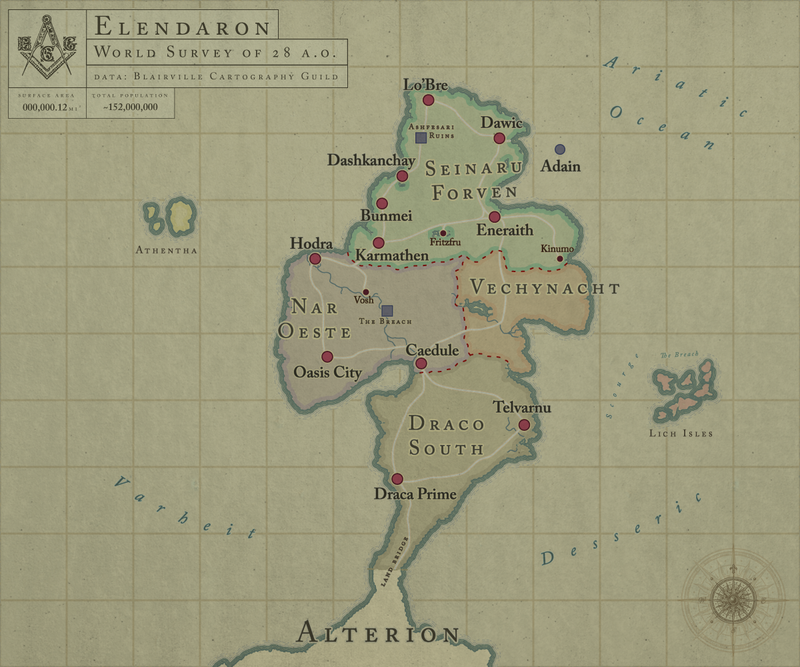 Climate: Different areas of Elendaron have different climates, due to magical disruption or location. In the north the climate is more mild, with only rain storms and a possible tornado or two to be disruptive. In the South there are plains and mild weather as well. In the West there are desert lands and jungle. In the East there is snow and wasteland. In the very center of Elendaron there is the Great Forest that has acquired aspects of all the areas climate. Species - There are a variety of mixed species in Elendaron. The majority of them are elves, dwarves, human, vampire, demon, and fae. Culture: Having to deal with wildly different climates and environments depending on where they are located, the people of Elendaron are a hearty and enduring people who are as familiar with sailing as they are with making their way through a jungle. They are a henotheistic culture, which means that many different parts of the populace will adhere to one particular god without discounting the possibility or existence of others. The Elendaron people are known for their enchanted gems and jewelry, as their land is covered with crystals known to have magic properties. Until the recent reign of Queen Malia, education in Elendaron has been focused mainly on textiles and subsistence farming; they are now focusing on engineering and magic to poise themselves to enter the global stage. Economy: The trade is fairly good with Elendaron. It’s resources are magical and unique. The crystals that litter the land and inside the mountains have magical properties, as well as can be used for energy purposes. There are flora and fauna found nowhere else in Valucre. Government: Elendaron is ruled by a Monarch. Queen Malia is the new ruler of Elendaron. She has inherited the title after the death of Queen Nylam, her distant cousin. Military: Each area has their own regiment of military soldiers, but they are all loyal to Queen Malia. She can request their services for war time at any time she deems necessary. Some areas have more military than others, and the queen also has her own personal protectors on hand. She also has a special forces unit made up of some of the most dangerous and skilled individuals. Some are public figures, while others wish to remain out of the public eye. Foreign Relations: Elendaron is allied with Athentha, Alterion, and newly allied with the underwater city of Adain. Education: Queen Nylam had always enforced a desire for higher education for her kingdom, and Queen Malia reinforces her cousin’s wishes. The areas are stressed to provide the best forms of education available to them, and education programs have been specially set up for relief for each area that requires it. Transportation: There are many forms of transportation. The most popular is the Obsidian Tear, which is a magical hover train that can transport all over Elendaron. There are also more modern areas in Elendaron, which allow for motor vehicles. And some areas still use horse and carriage. Some magical portals have also been found in or around Elendaron, natural warp gates that can take you to different destinations. These gates move continuously, and are not easy to find. If found the exact destination can not be determined, so most locals never use them. Dragon Wars - Long ago, there was a conflict between dragons and the rest of the species. A war broke out, and left many dead upon the earth. The dragons began to take heavy losses and were either slaughtered, or went into hiding. The dragon population had been scarce ever since. Some think that the dragons had died, or their bloodline had been weakened. Others say they are still hidden in Elendaron, in the mountains, or underground. Rosinder Takeover - Rosinder was a great kingdom, built in a savage time and a savage land. The people were warriors. No one knows exactly how the people were conquered or where they disappeared to. One day in the midst of another in a long line of wars, they vanished, and all that is left is the Elendaron you see now. Queen Nylam’s Reign - Queen Nylam began her rule after the Dragon Wars and the Rosinder Takeover. She was a fair ruler, kind and considerate of her people. She was well loved by most she ruled. Queen Malia’s Reign - Present day. Seinaru Forven - This is an area abundant in magic and dragons. There are giant crocodiles and hidden magical cities. The elven queen was born here, and many political endeavors take place in this area. Vechynacht - This is a land of darkness as well as cold. You can find horror as well as a comedic nonchalance among its people. Death is not done here, and you might find walking talking clothing items. Draco South - This area has a steampunk theme, with a more modern twist than the rest of Elendaron. Organized crime is common, and it has political conflict due to the distance from the queen’s home of Seinaru Forven. Nar Oeste - This land is harsh and wild, part of it being desert while the other half is jungle. Though as abundant in different species as the rest of Elendaron, Nar Oeste also boasts of a large population of vampires. Athentha - Floating mountainous islands decorate the sky, and its name is Athentha. They are allied with Elendaron, and are populated by a majority of demon species.